Add an architectural and ornate entry to your garden with the New England Nantucket Legacy Arbor with Trim. 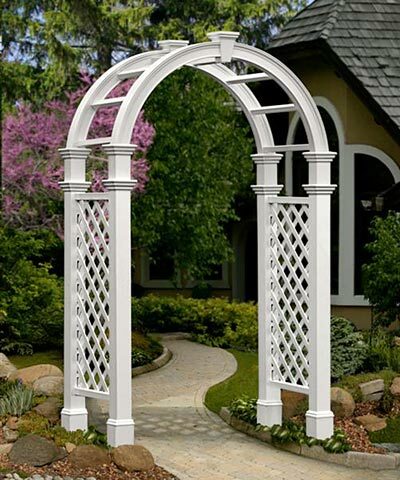 This romantic structure will certainly bring an inspiring hint to your yard, thanks to its white color, diamond-shaped lattice, and soft arch. Its shape lends a familiar silhouette to your garden, and the square, upright posts offer both stability and height. A flared molding at the base of each leg, along with dual trim caps at the top, enhances your backyard adornments, and the diamond-shape lattice on each side panel lends a classic touch. Horizontal bars help support the top arch, and a keystone detail here creates a focal point. Made from high grade, long lasting vinyl, this arbor will provide beauty and excitement for years to come. The white color keeps it looking new and vibrant, while the vinyl will never yellow, rot, or warp. Place a wooden 4 x 4 post (not included) into each leg to securely install it in soil, or use New England Surface Mounts (not included) to display this unit on a level surface. Bring a splendid look to your garden using this Nantucket Legacy Arbor with Trim. Assembly required. Twenty year guarantee. Post Dimensions: 4" x 4"